In the context of programming, a function is a named sequence of statements that performs a computation. When you define a function, you specify the name and the sequence of statements. Later, you can “call” the function by name. The name of the function is type. The expression in parentheses is called the argument of the function. The result, for this function, is the type of the argument. It is common to say that a function “takes” an argument and “returns” a result. The result is also called the return value. Python has a math module that provides most of the familiar mathematical functions. A module is a file that contains a collection of related functions. The module object contains the functions and variables defined in the module. To access one of the functions, you have to specify the name of the module and the name of the function, separated by a dot (also known as a period). This format is called dot notation. The first example uses math.log10 to compute a signal-to-noise ratio in decibels (assuming that signal_power and noise_power are defined). The math module also provides log, which computes logarithms base e.
The expression math.pi gets the variable pi from the math module. Its value is a floating-point approximation of π, accurate to about 15 digits. So far, we have looked at the elements of a program—variables, expressions, and statements—in isolation, without talking about how to combine them. Almost anywhere you can put a value, you can put an arbitrary expression, with one exception: the left side of an assignment statement has to be a variable name. Any other expression on the left side is a syntax error (we will see exceptions to this rule later). >>> hours * 60 = minutes                 # wrong! So far, we have only been using the functions that come with Python, but it is also possible to add new functions. A function definition specifies the name of a new function and the sequence of statements that run when the function is called. def is a keyword that indicates that this is a function definition. The name of the function is print_lyrics. The rules for function names are the same as for variable names: letters, numbers and underscore are legal, but the first character can’t be a number. You can’t use a keyword as the name of a function, and you should avoid having a variable and a function with the same name. The empty parentheses after the name indicate that this function doesn’t take any arguments. The first line of the function definition is called the header; the rest is called the body. The header has to end with a colon and the body has to be indented. By convention, indentation is always four spaces. The body can contain any number of statements. The strings in the print statements are enclosed in double quotes. Single quotes and double quotes do the same thing; most people use single quotes except in cases like this where a single quote (which is also an apostrophe) appears in the string. All quotation marks (single and double) must be “straight quotes”, usually located next to Enter on the keyboard. “Curly quotes”, like the ones in this sentence, are not legal in Python. To end the function, you have to enter an empty line. But that’s not really how the song goes. This program contains two function definitions: print_lyrics and repeat_lyrics. Function definitions get executed just like other statements, but the effect is to create function objects. The statements inside the function do not run until the function is called, and the function definition generates no output. As you might expect, you have to create a function before you can run it. In other words, the function definition has to run before the function gets called. As an exercise, move the last line of this program to the top, so the function call appears before the definitions. Run the program and see what error message you get. Now move the function call back to the bottom and move the definition of print_lyrics after the definition of repeat_lyrics. What happens when you run this program? To ensure that a function is defined before its first use, you have to know the order statements run in, which is called the flow of execution. Execution always begins at the first statement of the program. Statements are run one at a time, in order from top to bottom. Function definitions do not alter the flow of execution of the program, but remember that statements inside the function don’t run until the function is called. A function call is like a detour in the flow of execution. Instead of going to the next statement, the flow jumps to the body of the function, runs the statements there, and then comes back to pick up where it left off. That sounds simple enough, until you remember that one function can call another. While in the middle of one function, the program might have to run the statements in another function. Then, while running that new function, the program might have to run yet another function! Fortunately, Python is good at keeping track of where it is, so each time a function completes, the program picks up where it left off in the function that called it. When it gets to the end of the program, it terminates. In summary, when you read a program, you don’t always want to read from top to bottom. Sometimes it makes more sense if you follow the flow of execution. Some of the functions we have seen require arguments. For example, when you call math.sin you pass a number as an argument. Some functions take more than one argument: math.pow takes two, the base and the exponent. The argument is evaluated before the function is called, so in the examples the expressions 'Spam '*4 and math.cos(math.pi) are only evaluated once. The name of the variable we pass as an argument (michael) has nothing to do with the name of the parameter (bruce). It doesn’t matter what the value was called back home (in the caller); here in print_twice, we call everybody bruce. Parameters are also local. For example, outside print_twice, there is no such thing as bruce. To keep track of which variables can be used where, it is sometimes useful to draw a stack diagram. Like state diagrams, stack diagrams show the value of each variable, but they also show the function each variable belongs to. Each function is represented by a frame. A frame is a box with the name of a function beside it and the parameters and variables of the function inside it. The stack diagram for the previous example is shown in Figure 3.1. The frames are arranged in a stack that indicates which function called which, and so on. In this example, print_twice was called by cat_twice, and cat_twice was called by __main__, which is a special name for the topmost frame. When you create a variable outside of any function, it belongs to __main__. Each parameter refers to the same value as its corresponding argument. 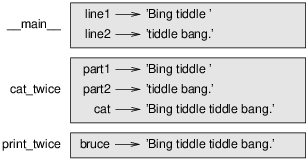 So, part1 has the same value as line1, part2 has the same value as line2, and bruce has the same value as cat. If an error occurs during a function call, Python prints the name of the function, the name of the function that called it, and the name of the function that called that, all the way back to __main__. This list of functions is called a traceback. It tells you what program file the error occurred in, and what line, and what functions were executing at the time. It also shows the line of code that caused the error. The order of the functions in the traceback is the same as the order of the frames in the stack diagram. The function that is currently running is at the bottom. Some of the functions we have used, such as the math functions, return results; for lack of a better name, I call them fruitful functions. Other functions, like print_twice, perform an action but don’t return a value. They are called void functions. But in a script, if you call a fruitful function all by itself, the return value is lost forever! This script computes the square root of 5, but since it doesn’t store or display the result, it is not very useful. Void functions might display something on the screen or have some other effect, but they don’t have a return value. If you assign the result to a variable, you get a special value called None. The functions we have written so far are all void. We will start writing fruitful functions in a few chapters. Creating a new function gives you an opportunity to name a group of statements, which makes your program easier to read and debug. In some ways debugging is like detective work. You are confronted with clues and you have to infer the processes and events that led to the results you see. For some people, programming and debugging are the same thing. That is, programming is the process of gradually debugging a program until it does what you want. The idea is that you should start with a working program and make small modifications, debugging them as you go. For example, Linux is an operating system that contains millions of lines of code, but it started out as a simple program Linus Torvalds used to explore the Intel 80386 chip. According to Larry Greenfield, “One of Linus’s earlier projects was a program that would switch between printing AAAA and BBBB. This later evolved to Linux.” (The Linux Users’ Guide Beta Version 1). A statement that creates a new function, specifying its name, parameters, and the statements it contains. A value created by a function definition. The name of the function is a variable that refers to a function object. The first line of a function definition. The sequence of statements inside a function definition. A statement that runs a function. It consists of the function name followed by an argument list in parentheses. A function that returns a value. A function that always returns None. A special value returned by void functions. A file that contains a collection of related functions and other definitions. A statement that reads a module file and creates a module object. A value created by an import statement that provides access to the values defined in a module. The syntax for calling a function in another module by specifying the module name followed by a dot (period) and the function name. Using an expression as part of a larger expression, or a statement as part of a larger statement. The order statements run in. A graphical representation of a stack of functions, their variables, and the values they refer to. A list of the functions that are executing, printed when an exception occurs. Write a function named right_justify that takes a string named s as a parameter and prints the string with enough leading spaces so that the last letter of the string is in column 70 of the display. Hint: Use string concatenation and repetition. Also, Python provides a built-in function called len that returns the length of a string, so the value of len('monty') is 5. Type this example into a script and test it. Modify do_twice so that it takes two arguments, a function object and a value, and calls the function twice, passing the value as an argument. Copy the definition of print_twice from earlier in this chapter to your script. Use the modified version of do_twice to call print_twice twice, passing 'spam' as an argument. Define a new function called do_four that takes a function object and a value and calls the function four times, passing the value as a parameter. There should be only two statements in the body of this function, not four. Note: This exercise should be done using only the statements and other features we have learned so far. The output of these statements is '+ -' on the same line. The output from the next print statement would begin on the next line. Solution: http://thinkpython2.com/code/grid.py. Credit: This exercise is based on an exercise in Oualline, Practical C Programming, Third Edition, O’Reilly Media, 1997.